When people with musculoskeletal system injuries in the US Southeast need treatment, they go to OrthoTennessee. There, the best orthopedic physicians are available to provide patients the most up-to-date, extensive care. But OrthoTennessee had even loftier goals – they also wanted to become a top workplace for their 700 employees. An organizational survey revealed that the top concern of staff was better, more frequent communication from management. The problem was that existing efforts had met with minimal success. For CIO Karen Clark, the ideal was communications that were exciting, natural and intuitive. In short, their internal comms needed more muscle. That’s where SnapComms were pleased to be able to help. Our platform helped OrthoTennessee truly get employee attention, despite a widely dispersed workforce across 11 locations, many of whom were busy attending to patients. Watch our video to find out how this data-driven healthcare organization bypassed email to dramatically improve its internal comms. Employee engagement is critical to OrthoTennessee’s goal of being a top workplace. We’re excited to be part of helping them achieve this. Read the full OrthoTennessee case study for more. 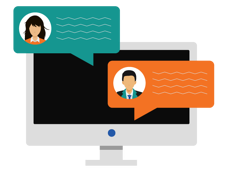 Could your organization benefit from boosting your employee communications too? If so, why not contact us today to find out how we could help you.